ELLICOTT CITY – Hope grows like a flower. It can spring spontaneously from the cracks of the pavement or the depths of tragedy with just the help of God’s gifts – sunlight, water and faith. More often, however, it is cultivated by human hands that supplement God’s gifts by preparing a place for it and nurturing it through the changing seasons. At Our Lady of Perpetual Help Parish in Ellicott City, caring hands are growing hope in the form of a garden dedicated to the children of the parish who have passed away. In recent years, the parish has buried five of its children. Three were struck down by brain cancer within a 15-month period, all while the parish was still reeling from the deaths of two other children, one from drowning and one from a bowel obstruction, in the two years prior. The garden honors the memories of all 101 parish members who, throughout its history, were called to the Lord while still in childhood. 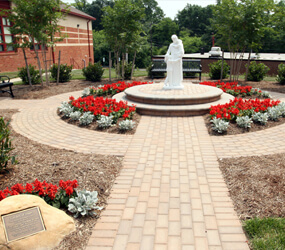 The “Garden of Hope” was dedicated June 4 on the campus of the parish and its school, in a well-traveled triangular parcel of land. “It is our hope that this outdoor sanctuary will provide a place of comfort and remembrance not only for the families, but for the many who need hope in their day,” said Lisa Sliker, mother of Christopher, who died of brain cancer in August 2009 at the age of 5. The Sliker family – Lisa, her husband Clint and their daughters Kelly, 10, and Lauren, 12 – has been the driving force behind the garden, using Christopher’s memorial fund to commission the statue at its center of the garden. The families of the other brain cancer victims – Richard “Ricky” Knight, who died June 2008 at age 12, and Caroline Herrmann, who died in December 2008 at age 14 – each sponsored a bench in the garden. Many more have put time and funds into the garden. Landscape architect Jeremy Clayton donated his services in the design, and Tony Pellegrino and his landscaping company actually built the garden. The children of Our Lady of Perpetual Help School raised $1,000 for the garden’s lighting. Shaped like a Celtic cross, the garden is anchored by a statue of Jesus lovingly holding a child in his arm and embracing another at his leg. Commissioned from an artist in Ecuador, the statue is raised on a platform, wrapped by red salvia and encircled by six crape myrtle trees interspersed with laurel bushes. “Being that we have a school on campus, the children will use the garden as a place to find peace, find some reflection time and pray and realize that God is with them all the time,” said Lisa Sliker. Though Christopher Sliker never got to officially attend OLPH School, he was a presence on the campus, as his two sisters are enrolled in the school. Caroline Hermann, meanwhile, graduated from OLPH. The garden as it matures will serve as a remembrance of the children. 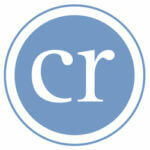 “Christopher you are dearly missed and you will never be forgotten. We are definitely together and always will be in spirit, in heart, in mind and in soul,” said Kelly Sliker, in her remarks at the dedication.